Amilova.com offers many features, all created in order to increase usability and make your experience enjoyable. 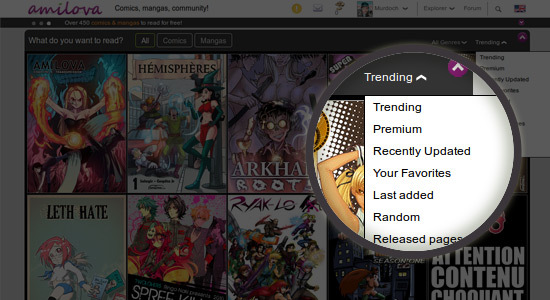 easily find your favorites on the homepage, use the filters at your disposal! 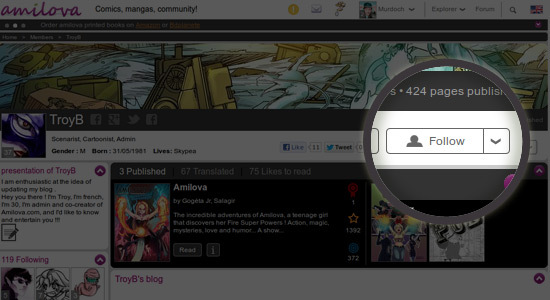 That way, you have immediate access and visual updates of your favorites. 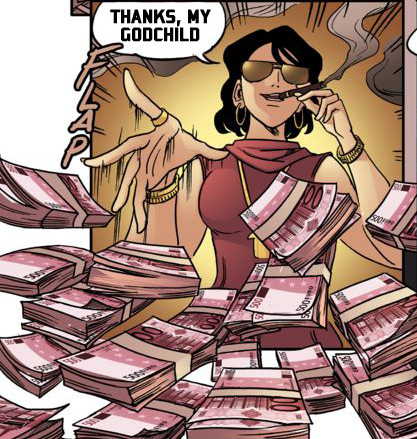 you no longer love a comic and you want to stop following it? 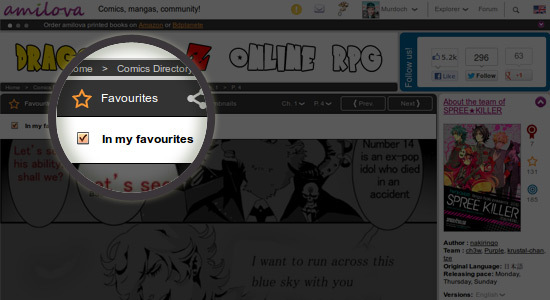 It's simple, go to any page of the comic in question and click on "Favorites". There you unchecked the box "In favorites ". The icon is again white, the comics has been removed from your favorites. Amilova.com has plenty of options to ease the reader's life. Here are the most important ones that you must not miss! If you navigated by error in a comic and you'd wish to erase your progress, it is possible! 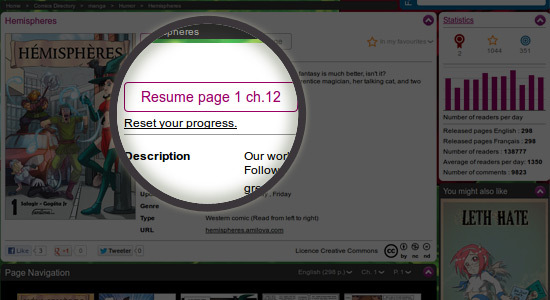 To do so, simply go to the information page of the comic and click on the link "Reset your progress." If you want to know more about the possibilities of navigation and configuration of your reading, we invite you to ask your questions on the forum! Again thank you for the interest you Amilova.com doors and artists in our community. In order to allow you to follow the news of your authors and the site, we have created several monitoring tools. You can easily subscribe to an author or member's news, simply click on the "Follow" link on the profile page of each member. whenever you subscribe, either a BD or a writer, you have the opportunity to receive an email alert. But be careful not to get too much email! If you're overwhelmed, you can quickly unsubscribe with the link in the email you've received. Every link will unsubscribed you from the notification that you just got. A good way to unsubscribe in each case. 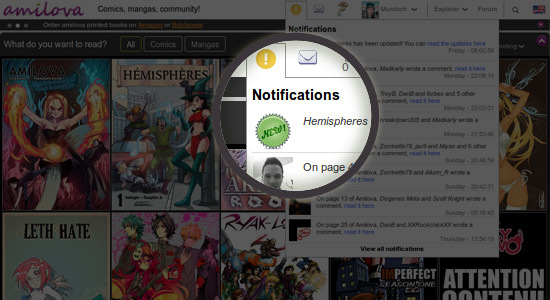 If you want to know all your alert subscriptions, you just have to go to the page of the notifications and click on "Notifications options". With thousands of members, you'll probably find friends on Amilova! Here are some tips for you to help. making friends is easy, just send a friend request. Go to the profile of your future e-friend and click on the little arrow next to the button " Follow"
who is friends with whom ? You just have go to the profile of the person in question and look in the left sidebar titled " Friends "
Spread the word and earn a premium membership! To ensure the survival of Amilova, we need more and more members and visitors. 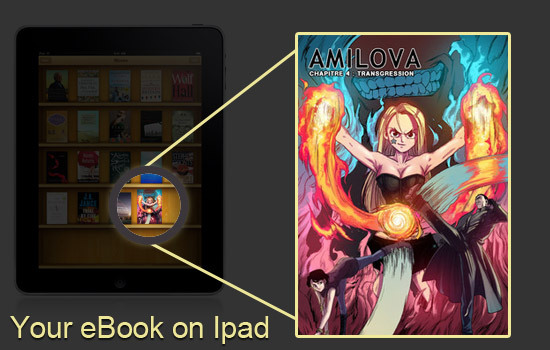 You can find all our tools on this page to share your comics and make known Amilova. Your username is automatically added to the tools, you just copy / paste your links on Facebook, Twitter, blog or favorite forum and you'll have the referrals! Support the artists by subscribing a Premium membership! Amilova.com is not only a mere platform, it is also a paper and digital publishing company. Our mission is to make our artists known and to support them in order to live from their art. But that's not all. The artists receive a percentage of each sale related to their work, whether on physical books, digital books, or derivatives. How to read your eBook ? eBooks available on our store are directly uploaded by the author. We're not checking each PDF so if you've any trouble with your eBook, please contact directly the author. You'll find here few information related to the eBook, where to download them and how to read them. If you want to transfer a file on your device, the best way is to log in on your Amilova's profile and to donwload it. You can also use cloud service as Dropbox or Google Drive in order to have your Ebooks available on all your devices. 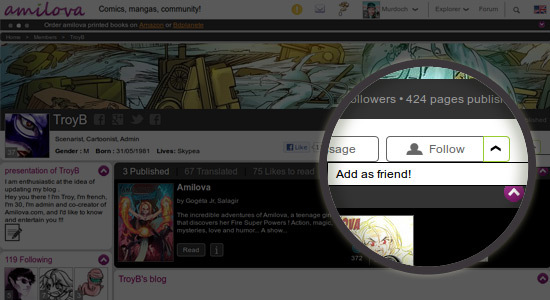 All your eBooks are centralized in your Personnal Collection page, go on your Amilova's profile (or click here). 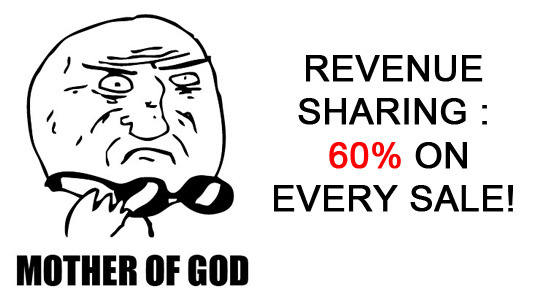 Before reading your eBooks, you must download it. For that, just click on the icon "Download". As Windows user, you can use Acrobat Reader or Foxit : (PDF readers list on Wikipedia). As Linux or Mac Os X user, you have pre-installed software which are pretty good for PDF reading. Chrome and Firefox browser have also built-in PDF reader but be careful, as our eBook are quite big (around 40mo), browsers can have problem to read it, and could slow down your computer. It's the easiest way ! You can use directly iBooks application on your devise. After downloading your file with your device, the eBook will be automatically added to iBooks and you'll just have to click on its cover to open it. On Android system, it's the same, you've a pre-installed PDF reader. But if you prefer, you can download any PDF reader from the Google Play store.